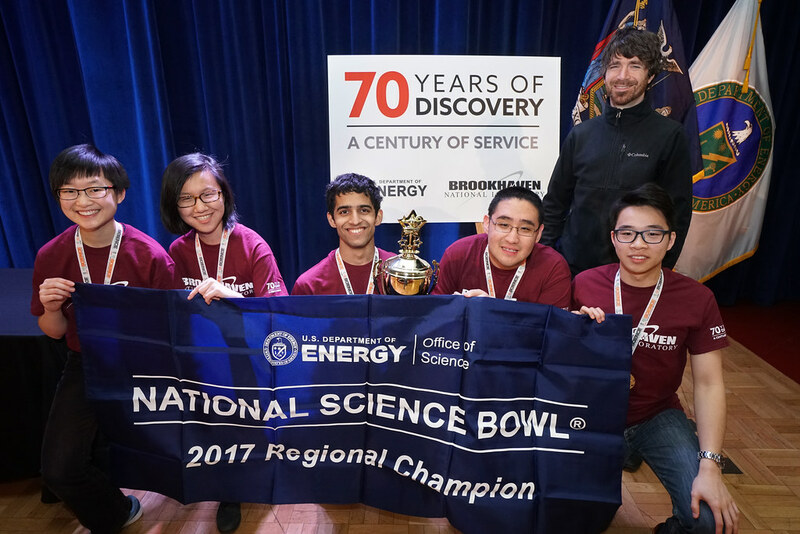 Great Neck South High School took first place in the Brookhaven National Laboratory/Long Island Regional High School Science Bowl held at the Lab on Saturday, January 28. Great Neck South competed against 18 other teams from across Long Island in one of the nation's regional competitions of the 27th Annual U.S. Department of Energy National Science Bowl® (NSB). As the winning team, Great Neck South will be awarded an all-expenses-paid trip to the National Finals in Washington, D.C., scheduled for April 27 – May 1. Middle and high school student teams from diverse backgrounds are each made up of four students, one alternate, and a teacher who serves as an advisor and coach. These teams face off in a fast-paced question-and-answer format, being tested on a range of science disciplines including biology, chemistry, Earth science, physics, energy, and math. In 2016, Great Neck South placed third, and took second the year before. But in an exciting finish this year, the team edged out Wheatley School for first place. North Babylon High School took third place, and Island Trees High School finished fourth. Great Neck South biology teacher and coach Jim Truglio said, "I love science, I love the competition, and I love watching the team improve and learn every year. We have a ton of fun. It becomes like another family." Great Neck South’s team consisted of five students – Melody Yang, Elissa He, Ajay Dheeraj, Allan Lee, and Adrian Chen. "You learn to trust other people, like when you don't know the answer but your teammates do," added Elissa He. A series of 116 regional middle school and high school tournaments are being held across the country from January through March. Winners will advance to represent their regions at the National Science Bowl®, held from April 27 to May 1 in Washington, DC, for the final middle school and high school competitions. The top 16 high school teams and the top 16 middle school teams in the National Finals will win $1,000 for their schools' science departments. Prizes for the top two high school teams for the 2017 NSB will be announced at a later date. In the competition at Brookhaven Lab, participating students received a Science Bowl t-shirt and winning teams also received trophies, medals, and cash awards. Prizes are courtesy of Brookhaven Lab's event sponsor, Brookhaven Science Associates, the company that manages and operates the Lab for the U.S. Department of Energy. Approximately 265,000 students have participated in the NSB since it was established in 1991, and it is one of the nation's largest science competitions. The high school team that won the 2016 NSB received a nine-day, all-expenses-paid science trip to Alaska, where they learned more about glaciology, marine and avian biology, geology and plate tectonics. The second-place high school team at the 2016 NSB won a five-day, fully guided adventure tour of several national parks, which included a whitewater rafting trip. The U.S. Department of Energy's Office of Science manages the NSB and sponsors the NSB finals competition. More information about these events is available on the National Science Bowl® website (link to https://science.energy.gov/wdts/nsb/ ).